I know that this product isn't at the cutting edge of newness (if that even is a word) but after ending up right in the middle of a Wheelie Bug situation today I thought that it was well worth a post! In our house we have three. They have been a part of our lives for many years and my little ones have spent many an hour chasing each other around our house only to end up with a very large crash situation. 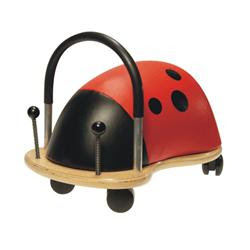 Our old nanny was also partial to the odd Wheelie Bug race and it is very entertaining to see a full size grown up racing around on one. They do make a great toy / gift for any child and have a great use life. They do come in two sizes but I would suggest getting the larger one (especially if you would like a go yourself). There are lots of different styles out there now but my money is on the Ladybirds. I love this-- just got the bee for my baby! Only in one store in Rome, from what they say. . .
You will really enjoy it. They are so much fun!